When potters seek additional colorful effects on their clay pottery pieces, it is rarely done with traditional paints. Typically, potters tend to "paint" their work using other ceramic materials, such as underglazes, slips, and oxide stains. All of these fuse to the clay body when fired to maturity, so they are not likely to wear or flake off, as paint does. But when a pottery piece is not intended for functional use—such as when it is intended as display art—then some traditional paint materials can be used. You can get effects similar to watercolor paintings on pottery if you use an underglaze that is both thin enough and has enough colorant in it to minimize fading. AMACO's semi-moist underglaze pans work quite well for creating watercolor-like effects—they are much easier to control than liquid underglazes when you are seeking wash effects. For more acrylic-like effects, you can use liquid underglaze and work with a much heavier, "painterly" style that puts a lot more underglaze on the clay surface. With liquid underglazes, It is best to work in layers, since many are not at full-strength until you have three layers on the clay surface. Be prepared: Dark colors will bleed through overlying layers, even if you cannot see them prior to firing. A slip—a liquefied suspension of clay particles in water—can also be used to color clay pottery prior to firing. You can use either white slips or colored slips tinted with oxides. Some potters save the slips left over when throwing other pieces. Slips are best used on wet greenware. It is much easier to fully clean off mistakes. Slip painting better matches the clay's shrinkage, which in turn means less worry about heavier applications popping off during drying or firing. Because the slip painting gets bisqued along with the pot it is on, you can add additional color using underglazes (or other engobes) to strengthen the visual impact or further define the image. Oxide stains are wonderful for painting flowing lines, as well as for adding broad areas of color. You have the option of using commercially prepared stains, which often use fritted material to make them both safer to handle and more chemically stable. Or, stains can simply be earth oxides mixed in water, but with these, you will need a good handle on what glaze goes over it. Some oxides are fickle and will change color dramatically depending on what other elements are in the glaze. For example, chrome oxide is generally considered a green colorant, but if there is tin in the glaze, it can go pink. Potters have been painting on ceramics for many years simply by using glazes themselves. This includes glaze-on-glaze painting, such as seen in the majolica traditions, as well as painting various areas with glazes of different colors. One problem with this method is that the glaze is more likely to flow when it becomes moten during the firing. This can cause designs to sag, become indistinct at the edges, or even disappear into an underlying glaze completely. 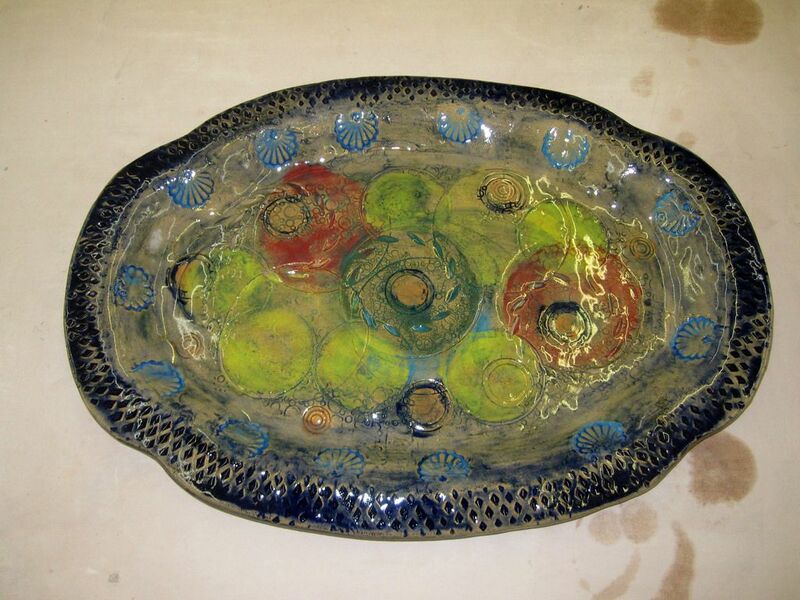 When a pottery piece doesn't need to be functional, you are no longer limited to using ceramic materials to paint it. Pottery artists can, and do, use any variety of other traditional paints to ornament pottery pieces that do not need to be functional. But be aware that these non-ceramic options are likely to flake or peel off if the finished piece becomes wet or is intended for permanent outdoor use. Ceramic pieces designed to serve as display art is one area where artists frequently use traditional paints. Two non-ceramic materials can be especially useful for this kind of painting. Acrylic paint is most commonly used, but fingernail polish can also create effective results. Unlike other paints, both these materials have the advantage of being non-water-soluble once they have dried. Besides the lack of functionality, using acrylic paint or fingernail polish has another principle drawback: They can visually flatten and compromise the clay surface they cover. It can be quite hard to visually integrate these materials fully with the clay.